Not much to report from Bev's world of knitting today, but as always, I have some ideas rattling around in my head. Since finishing the Klara Bird sweater this past weekend, my sole knitting project has been the Kimono Shawl pictured above. The photo shows my progress, which is poor, but I haven't been working on it that much. It should grow faster now that I don't have another project to compete. I think it will be almost as beautiful a shawl as I pictured it to be. The mostly silk yarn is soft and cottony feeling with some heft. This is undoubtedly a good plan. 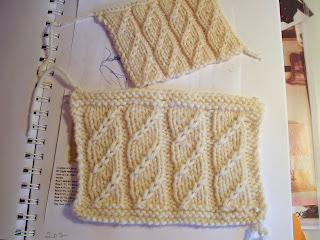 But then I started to swatch the lace motif and Whoa Nelly! It is really hard, not simple and serene like the Kimono Shawl. The lace patterning occurs on both the knit and purl sides, and it features purls through the back loop, my most hated stitch. So maybe another time. I really do want to knit this sweater and will tackle it before the summer, but not yet. The Knit Picks swatch is on the bottom. Each has about the same number of stitches. I think the Knit Picks one might have 2 more. The Knit Picks swatch measures about 6 inches, the RYC about 4. Knit Picks DK is horsey and coarse. My parents generation had a saying, "penny wise and pound foolish." So this week, I ordered the RYC Cashsoft DK with the plan to work up that cardigan design. Meanwhile, what to do with the Knit Picks DK.? I am thinking about it. Thanks for sharing your experience with Knitpicks Merino Style. I'm contemplating using it for a shawl, but I guess I should first swatch from the one skein I have on hand. The skein feels really soft, but I haven't really played around with the yarn yet. 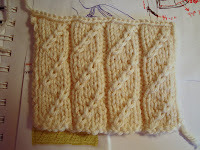 I had the same frustrating experience this week, swatching for the kimono shawl as you had with the Shirley Paden top. I was searching for the right shawl pattern for some Madil Kid Seta but the fuzziness really obscured the pattern too much. It worked better with a related fern lace pattern. The swatch looks lovely. 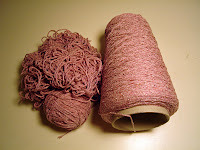 Rowan yarns are pricey but the color and quality are truly special.